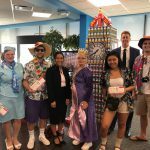 SARASOTA, FLA. (Dec. 4, 2018) — The tradition started in 2011, with small LexJet teams working to come up with interesting themes for their “canstruction” projects, created from food items to be donated to All Faiths Food Bank: Best Vegetarian Contribution or Best Carbohydrate Donation. 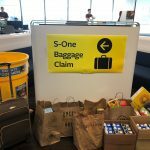 That first year, LexJet, now a division of S-One Holdings Corporation, donated almost 1,200 pounds of food to All Faiths. 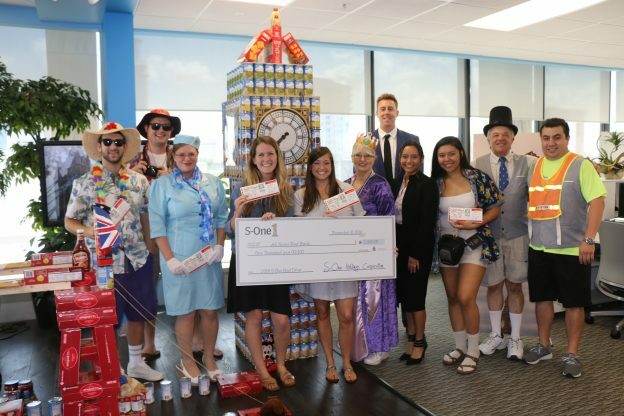 Over the years, competitive S-One canstruction builds included printers, Wrigley Field, a Thanksgiving Day parade, and even working replicas of video games, skee ball and board games. 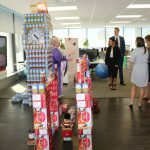 Last year the theme was movies, and the “Wizard of Oz” and “Toy Story” canstructions generated nearly 2,200 pounds of food — for the first time, the 1 ton mark had been reached. This year, S-One’s global offices created an “Around the World” experience for All Faiths. 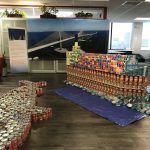 Starting on the fifth floor of S-One’s corporate offices on Main Street, the “journey” starts over the Skyway Bridge, complete with a toll booth, cargo ship and a shark in the water. 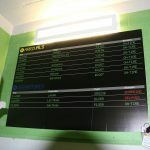 The trip continues through our stairwell, which represents the airport, along with a board of arrivals and departures. 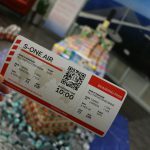 Next, you see the S-One Barcelona team in their airplane seats aboard “S-One Airlines.” Finally, the trip ends in London where visitors rendezvous with the Meghan and Harry and the Queen at Big Ben and Tower Bridge. When the trip was over, Art Lambert presented the team from All Faiths a check for $1,000 and more than 1.26 tons of food had been collected. 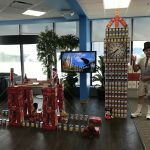 To see all the action throughout S-One’s offices during the 2018 Food Drive Canstruction project, click through the gallery below. 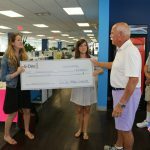 The final stop: A worthy cause! About S-One: S-One Holdings Corporation is a global holding company headquartered in Sarasota, Fla., that oversees a number of subsidiary companies: ABAQA, Avatrex, Brand Management Group, LexJet, Utopia Digital Technologies and S-One Labels & Packaging. Through its subsidiary companies, S-One has strategic alliances with Michelman, Toray America, Protect-all, Marabu Coatings, Vescom America, Fredrix Canvas, HP and KODAK.